Milton has often been referred to as the last farming village on Portsea Island, and for good reason. Whilst the rest of the island embraced the urbanisation afforded by the expansion of the dockyard around the middle of the 19th century Milton remained rooted in it's agrarian past. To some extent this can be explained by geography - Milton was well off the principle line of expansion from Portsmouth and the Dockyard north to Hilsea, but perhaps more important was the value of the farming land itself. As the population grew so did the need to feed it, and the land around Milton was especially well suited to arable farming and market gardening. The pressure to change therefore did not exist in Milton to the same extent as elsewhere. The modern history of Milton can be thought of as having begun in 1722 when John White, future mayor of Portsmouth, bought the manors of Milton and Eastney. The estate was increased over succeeding years by the purchase of more land, both in and around Milton. On his death the estate was passed down the family until it reached Mary White who has been described as a 'lunatic' by Suzanne Shuttleworth and as niece of John White and mother of John Bonham Carter by William Gates. When she died in 1831 the land was passed to Ann Isabella Henderson, the wife of Sir Philip Henderson Durham who assumed control of the estate. Although the White estate had been the most extensive around Milton it was by no means the only one. Other major landowners included the Leggatt, Leeke, Hill and Gilbert families, and, just beginning to make their presence felt was the Goldsmith family, headed by the first of four members named James. In 1750 there was little to indicate they would come to dominate the village but they did own some land to the south and east of the village, adjacent to Hill Lane (Winter Road) and Milton Lane (Locksway Road) respectively. It wasn't until 1808 that the Goldsmith's bought what was known as Purnell's Farm which was later renamed Middle Farm lying at the centre of the village in what is now Milton Park. Up until the 1840s the history of Milton is dominated by the farmers and land-owners but in 1841 the first detailed census was carried out allowing a much broader picture of the community to emerge. This was further aided by the publication from 1835 of the Lists of Burgesses and the Tithe Map drawn by Thomas Ellis Owen, published in 1845 together with a schedule that detailed the owner of each plot of land on Portsea Island, the current occupier and the purpose to which the land was used. 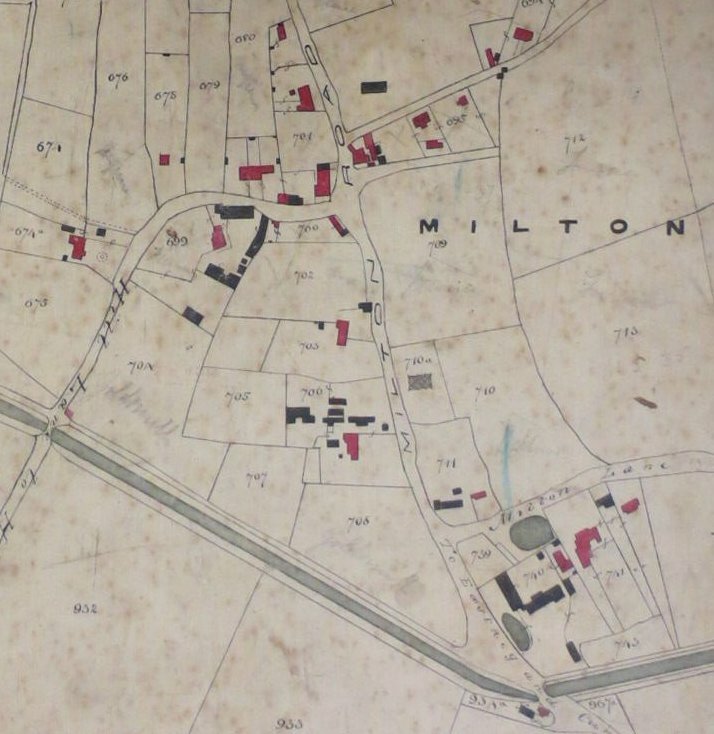 Anyone wanting to understand mid-century Milton could do no better than follow the principal enumerator covering the area for the 1841 census as he recorded almost every member of the tiny community on the 6th June that year. He began his day at Shepherd's bridge which spanned the derelict Portsmouth and Arundel canal at what is now the junction between Goldsmith Avenue and Priory Crescent/Winter Road. From there he travelled north along Hill Lane (Priory Crescent). To his left was The Old Priory where lived the pensioner and burgess 89 year old Martin White. A little further along Hill lane, just as it was bending to the right there stood Milton Villa, set back from the road on the left behind ornamental gardens. This was the home of 69 year old, retired butcher and landowner, John Feltham. As Hill Lane completed it's turn to the east two buildings could be seen on the north side of the road. They were collectively known as Milton Place but they were of very different construction (see Images of Milton for photographs of this and other buildings mentioned below). On the left was a pair of semi-detached, brick built, three storey houses whilst on the right there was a single, two storey, thatched structure divided into three or four cottages. The census returns suggest that there were 7 or 8 households living at Milton Place which probably means that the brick building was sub-divided into flats. The occupants varied from Navy Pensioners William Gleeson and John Mullins to fisherman John Hartfield and policeman William Coffin. Next door, standing right against Hill Lane were the houses of Elizabeth Passingham, a widow, and her son Henry who was the village blacksmith. His smithy stood next to his house and consisted of a single storey, wood and thatch structure. A little further east Hill Lane ended at the junction with Milton Road. Our enumerator turned north, passing first a block of cottages on the corner and another called Prospect Terrace, which mostly housed agricultural workers. Beyond them at the north end of the village, on the west side of Milton Road, was Gomer Farm but the farmer was absent on census night. Across the road was the junction with Velder Avenue on which was located just one homestead, Velder Lodge, which was situated near to the site of the modern Good Companion Public House. Having recorded the occupants the enumerator retraced his steps to Milton Road and turned south, walking until he reached Warren Lane (now Warren Avenue) on the left. A hundred yards down the lane were three or four cottages on the left owned by James Feltham and occupied by Oyster Merchant John Gamble and several agricultural workers. Back nearer Milton Road were the dwellings of sisters Elizabeth Gain (50) at Rodney Lodge and Kate Gain (60) at Hope Cottage. Nestling close to Rodney Lodge was the Travellers Joy Public House, run by landlord Henry Harvey, which faced onto Church View. From the Travellers Joy the enumerator faced a long walk, first south down Milton Road, passing the new St James's Church, then nearing completion, and east along Milton Lane (now known as Locksway Road but also known at various times as Lily or Lilies Lane, Anglesea Lane, Langston Lane and Asylum Road). He walked all the way to Port Royal Farm which was on the eastern side of the junction with modern day Furze Lane. There he recorded the details of four farm workers and their families before continuing his journey to the edge of Langstone Harbour where in an isolated cottage he found 77 year old George Atwell who was described as a 'Smith'. Returning down Milton Lane, there was a scattering of cottages on the south side of the road. The enumerator first encountered William Piper, a shipwright, before recording the details from 10 households consisting largely of labourers and pensioners but also including the fisherman George Rogers, the grandfather of George James Rogers who wrote "Memories of Milton" in 1985. Next on the list should have been Milton Manor House but the occupants seem to have been away at the time of the census. The house was owned by Sir Philip and Lady Anne Henderson Durham and let to Captain John Hallowes. Next door was Milton Farm, also owned by the Durhams and in this case let to James Ellis snr., which was situated where the Adult Education College stood in 20C. Leaving Milton Lane and crossing Milton Road brought our enumerator to Middle Farm, the home of the second James Goldsmith, then 66 years of age, with his wife Ann and children. Moving north along Milton Road the next buildings encountered are a delightful set of cottages, one of which is occupied by the farmer George Leggatt, who also owned the land and let out some of the cottages. Further north we return to the junction with Hill Lane where, on the site of the latter day Milton Arms, lived the wheelwright John Egerton and his family. Egerton almost certainly belonged to an extended family of wheelwrights, other members of which lived on Wish Lane (later, Albert Road) in Southsea. The final stretch for the census enumerator took him back along Hill Lane where first he reached a cottage, directly opposite the blacksmith's shop, occupied by the widow Elizabeth Maybee. Then came a farm complex owned and occupied by Edward Turner which was known in some records as Upper Milton Farm. Completing the circuit at Shepherd's Bridge the enumerator recorded one last entry, that of Benjamin Passingham who just happened to be a shepherd living on the corner diametrically opposite the later Shepherd's Crook. There were in fact two other census enumerators operating in Milton that same day, both of them south of the Canal. The first included within his schedule the White House public house, run by landlord Thomas Sutton, which was just south of the Milton Road bridge over the canal and the other listed the Thatched House public house, landlord Thomas Saunders, close to the locks at the end of the canal. The 1841 census shows us a village of 56 households. There were few heads of houshold below the age of 40 whilst the average was around 48 years. About half the heads were involved in agriculture, 4 farmers, 18 labourers, 2 sawyers, with a few independent trades such as blacksmith and wheelwright. The rest were pensioners, of independent means or connected to the sea either as fishermen or in the Navy. Noticeably there was no one with any medical qualifications nor a schoolmaster or vicar. The years after 1840 saw the dockyard expand rapidly and fuel an urbanisation of the surrounding land. Such dramatic change of land use passed Milton by, but there were a few developments in that the village soon gained both a church and a school. The latter was built at the corner of Milton Road and Velder Avenue, on land that would later become part of Milton Cemetery, and the first church, St. James's, was constructed on land owned by the Durhams on the east side of Milton Road. Very soon afterwards a Congregational church was built almost opposite St. James's (see The Churches of Milton for details). Throughout the 1840s the number of electors, or burgesses, in Milton remained fairly constant at 16-20. Those who were qualified to vote in the early years were, as might be expected, the farmers, the merchants, the tradesmen and the pub landlords, but there were also several fishermen and labourers. On 18th December 1844 Lady Anne Henderson Durham died to be followed by her husband three months later. It was Lady Anne who actually owned the land in Milton despite Sir Philip generally being credited as landlord and in her will she decreed that all the land, including both Milton and Eastney Farms should be put up for auction. They were duly sold on 9th October 1845. It's not clear who purchased the land but we know that in 1846 James Ellis retired from farming following the expiry of his lease and both farms were advertised for letting. We know that James Stephens and Charles Jolliffe took over at Milton and Eastney Farms respectively. James Ellis joined his son-in-law Robert Jolliffe at a farm on Lazy Lane, Southsea. Around the same time (July 7th 1846), at Upper Milton Farm, Ellen Turner, daughter of Edward, married Charles Bovill Smith who moved in to help manage the farm. Smith made quite a name for himself over the ensuing years as a Borough Councillor, churchwarden and Auctioneer but it was the suicide of his father-in-law in August 1847 that allowed him to become one of the more powerful farmers in the area. Smith was also a member of a fairly exclusive group of businessmen who managed to register to vote in two different wards at the same time, as an auctioneer at his Queen Street offices in St. John's Ward and as a farmer in St. Mary's Ward. In the following few months two of Smith's neighbours died, firstly the blacksmith, Henry Passingham in October 1847 and then, in January 1848, John Egerton the wheelwright who left his wife Ann to support herself by converting their house to a grocers shop. By 1850 the White House had been taken over by George Frawley who lost no time in getting convicted and fined for after hours drinking. In 1851 Benjamin Passingham died and his freehold cottage by Shepherd's Bridge was sold to James Stephens who later converted the property into the Shepherd's Arms. The 1851 census revealed that the number of households in Milton had increased markedly, possibly by as much as 30%, but maps of the period suggest there had been relatively little building work carried out in the previous decade which in turn suggests that the existing housing stock had to be accommodating more families. Surprisingly the number of names that appear on both censuses is rather low at 19 out of the 56 named on the 1841 census, contrary to the higher proportion we might have expected in a settled rural community. It is noticeable that whilst the farmers and pensioners have largely remained in place the greatest turnover is among the labourers with only 5 out of 19 having stayed. The number of burgesses had also increased considerably to 50. In August 1853 the owners of three prime sites on Milton Road put them up jointly for sale as "exceedingly desirable for building purposes". These were Messrs. Leggatt, Egerton and Wassell and the land they were selling occupied the north-east corner of what we now call Milton Park. More significantly it lay immediately to the north of the farm owned and occupied by James Goldsmith. The prospect of urbanisation reaching Milton on his very doorstep probably did not enthuse Goldsmith and though we do not know the cause, the sale did not go through. We can be sure of this because in April 1855 the Hampshire Telegraph notified readers of the sale of the same property by the Leggatt family following the death of George Leggatt in March 1855. This time it seems that James Goldsmith succeeded in buying the property and putting it out of the reach of the developers. A month later the property to the north, still in the hands of the Egerton family was also put on the market and again was purchased by Goldsmith. In June 1858 the second James Goldsmith died and was succeeded by his son, the third to be called James, but there was to be no change in the family's relentless acquisition of land. Although the popular history of Milton ascribes the lack of housing development in Milton at this time to the Goldsmith family, Suzanne Shuttleworth credits them with the erection of a moderate amount of accommodation, all well away from their own residence. The census of 1861 tells us that the population of the village was continuing to grow. The number of households in this year was recorded as being 111, almost double the number that existed twenty years earlier. As has been noted in the 1851 census it seems that families were to some extent crowding into the existing accommodation as, for example, Milton Place was now housing 19 households as opposed to 8 or 9 in 1841. Some of the households were occupying newly erected cottages, most notably in Engine House Lane (Ironbridge Lane) where a group of five dwellings had been built. Another five were built further westwards along Milton Lane and we see for the first time mention of The Old House At Home, a public house that has survived into the 21C. Another marked change in the make up of the population reminds us that though Milton may have been isolated it was not immune to the growing paranoia over the possibility of an invasion by the French. The garrison at Fort Cumberland was being substantially strengthened and at the time of the 1861 census there was simply not enough accommodation for the military personnel at the fort with the result that 23 Royal Marines and their families were in effect billeted in the village. This would be a short term effect as plans for the new barracks at Eastney were already on the drawing board. After 1861 the population trends established over the previous two decades were maintained along with a modest increase in the number of dwellings. It would be 50 years however before the last of the Goldsmiths died allowing a rapid development of the area until in the 21C it is almost impossible to discern traces of the original village, subsumed as it has been into the wider conurbation of eastern Portsea.